“In one of the rooms in the hip-hop culture house engraved on the walls” Is a live account of the 1 Super Soul Sista, who has the blessing to be dubbed “the Angela Davis of hip-hop”. 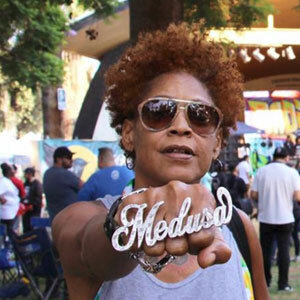 Starting off MCing as a 16- year old pop-locker, Medusa continues to cultivate hip-hop seeds across the country in unprecedented numbers. The love of hip-hop encouraged her to follow higher callings than her knowing. Pop-lockin with the Groove-Atrons gave her talents a platform to win the Beset Female Dancer in the 1st Hip Hop Dance Awards at The Palladium. “Medusa has been compared to a medley of amazing artist” Including, Gil-Scott Heron for their ways of expressing the revolutionary state of mind, Chuck D. (imagine a female Chuck D.), Lauryn Hill for having the ability to posses an international talent in the voice world and like the Game, who’s a versatile heavy hitter on speaking his life’s truth’s, Medusa gives you the key to real truth and allows you to feel it and even though the comparisons could go on, Medusa is on a Goddess list of her own.